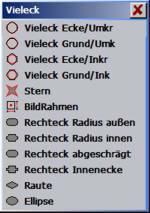 The functions in the Draw menu. Every input (section, contour, ..) begins with a position exchange. A withdrawn position is a free movement of the machine with raised tool for the start position. 2D milling movements are, for example, carried out using position incised. An incised position is a milling movement of the machine with tool lowered or incised to the specified position. The desired milling depth for PosnE is, for example, determined using the incised depth of the layer tool or according to the calculation of the milling data in the CAM area. Input start point for the graphic. With Position A the start of a contour or a section is determined. The engineering aid can be activated using the middle Mouse key <M> (alternatively using <F2> or <Sft> and right Mouse key <R>). Input support point of a 2D polygon absolutely in X und Y. During the cursor input, a line is also carried continuously as “rubber band”. Only PosnA can be entered with an empty layer. <M>,<F2>: Engineering aid (see above). Input an absolute position 3D with X,Y,Z coordinates. Following the cursor input the coordinates can be edited in 3D. If only 2 coordinates or Z = 0 are input, then a 2D position (PosnE) is created. A 3D position can be modified using edit . displace position.
. The drilling depth is determined using the incised depth of the layer tool. Note: for the input of a point grid one can work with capture grid support. Using operat . series/tilel regular point alignments can be created by copying. Points can be provided with (drilling/cutting) characteristics in HCAM. Input point (vector) for an incised or withdrawn line. With input via the keyboard the separation in the X and Y direction between the last position and the target position is input. The cursor input does not differ from the input of a position. The engineering aid can be activated using the middle Mouse key <M>(alternatively using <F2> or <Sft> and right Mouse key <R>). Straight dX,dY A: Straight, incised, input dX,dY (Positioning aid). Straight dX,dY E: Straight, incised, input dX,dY. Straight R,An E: Straight, incised, input radius, angle. Straight15° R,An E: Straight, incised, input radius, angle divisible by 15°. Straight R,dX E: Straight R(absolute) and +/-dX, dash prefix dY results from the Mouse posn. Straight R,dY E: Straight R(absolute) and +/-dY, prefix dX results from the Mouse posn. Straight An,dx E: Straight An, dX(absolute). Straight An,dy E: Straight An, dY(absolute). Input line with start (PosnA) and end point (PosnE) absolutely. Draw a free-hand line using the cursor. After pressing the key <L> the cursor positions are taken over continuously until release and displayed as frequency polygon (section). Free-hand lines are optimised automatically by the program. Input a spline using any desired number of support points. the spline resolution (number of the interpolation points) are determined through Input parameters . Spline resolution. Using the function Spline the next constant curve is drawn through a number of support points. The calculated curve in all cases runs through these points. With small changes in slope these can lie far apart, in tight areas of the curve they should, however, be selected more densely. Points of discontinuity, i.e. kinks in the curve, cannot be input as spline. Here the function must be discontinued and a new spline started. The last position input determines the slope of the curve in the end point. During the input a line to the position is also carried as “rubber band”. As soon a 3 support positions are input the start of the curve is also drawn. A support point is adopted using <L>. Using <R> the function is ended (last spline position). If, during the input of a spline, a start point is selected near the contour start point, then this point is captured and the contour closed. Further point input creates a new spline with new contour start point. Input a polygon, star, frame, rectangular object, hash key or ellipse. Polygon corner/inrad. : Polygon with perimeter radius. First the reference position (middle point) of the polygon is interrogated. For this, with the cursor cross, go to the point at which the middle point of the polygon is to lie and press <L>. As further input the number of corners and the angle of a corner are expected – this input must take place via the keyboard. With an angle of 0 deg. a corner lies right at the height of the middle point. The polygon is codrawn during the cursor movements. The circumradius / inradius can be input via the keyboard in mm. Polygon base/inrad. : Polygon with perimeter radius. First the reference position (middle point) of the polygon is interrogated. For this, with the cursor cross, go to the point at which the middle point of the polygon is to lie and press <L>. As further input the number of corners and the angle of the baseline are expected – this input must take place via the keyboard. With an angle of 0 deg. the baseline is horizontal. The polygon is codrawn during the cursor movements. The circumradius / inradius can be input via the keyboard in mm. Star: Star with 3..20 points. Using this function stars in various shapes can be input simply. Zero position: The middle point of the star is demanded as first point. Corners, angle: As further input the number of points (corners) and the angle of a point are expected – this input must take place via the keyboard With an angle of 0 deg. a point lies right at the height of the middle point. Incircle: the incircle defines the minimum elongation of the points. The incircle can be input via the keyboard or using the cursor. Outer circle: the outer defines the maximum elongation of the points. The outer circle can be input via the keyboard or using the cursor. With the cursor input the points are codrawn. Rectangular object: Create different rectangular objects as well as hash key and ellipse. Follow the input in the respective windows. The reference position can be selected respectively following selection using <F2>, <M> also using the cursor. Three positions are required for the input of arcs. The end position of the last function or PosnA counts as 1st position. The 2nd and 3rd positions can be input using <L>. The 1st and 3rd position determine respectively the end points of the arc. The 2nd position should as far as possible lie in the middle of the arc. During the input of the 2nd position a line is carried continuously as “rubber band”. The circle is codrawn with the input of the 3rd position. Display R in mm, SA and Al in deg. Input arc with radius and 2 points (start point and end point). Several variations are possible through specification of direction of rotation, selection of larger/smaller arc and arc start. Large arc neg. : Large arc clockwise (math. negative). Small arc neg. : Small arc clockwise (math. negative). Large arc pos. : Large arc anticlockwise (math. positive). Small arc pos. : Small arc anticlockwise (math. positive). Arc start 0° / 90° / 180° / 270°: Input of arcs using cursor, which close on the last input using a specified angle. Arcs can be input via keyboard. These arcs cannot be input using the cursor. Arc R,SA,AL: Arc input using the keyboard via the input of radius, the start angle and the arc length. R : Circular radius in mm. SA : Angle for start of circle in deg. AL : Angle for the arc length in deg. Arc R,SA,EA: Arc input using the keyboard via the input of radius, the start angle and end angle. The direction of rotation results from the sign of EA-SA. R : Circle radius in mm. EA : Angle for end of circle in deg. Arc C,S: Arc input using the keyboard via the input of radius and crown height. Both end points of the arc lie on a horizontal line. The crown height must be smaller than the radius. S : Crown height in mm. Selection for rounded or circular elongated hole. Input for a straight line, horizontal elongated hole. The elongated hole is rounded–off over the complete thickness. Centre Zx/Zy: Reference point (elongated hole middle) in mm. Width B: Width of elongated hole in mm. Thickness D: Overall thickness of the elongated hole in mm. Input for an elongated hole in the arc. The reference point and the dimensioning can be determined via various parameters. Position <F2>: Shift for input >centre or hole middle. Centre/hole middle: Reference point in mm. Main radius R: Radius from centre up to hole middle in mm. Thickness D: Thickness of the elongated hole in mm. Angle/width <F2>: Shift of the dimensioning. Posn angle/start angle: Dimensioning angle in deg. Segment angle/meas. width/end angle: Dimensioning angle in deg. or dimensioning width in mm. Input a full circle with 2 diagonally placed points on the circle. Input an ellipse with 2 diagonally placed points on the circle. The full circle input is acknowledged using <L> and aborted using <R>. Close the last section (still unclosed track) to the start point, so that a closed contour is created. If another (not the last) section is to be closed than this section can be selected using the marking aid and then combined to a contour using Close track.